Okay so now that you've followed Karsten's blog (extra point) you may now enjoy the video! Be sure and vist the other blogs participating in the Wildefire tour for more chances to WIN a copy of the book! And if that isn't enough, BooksCompleteMe will be having a TWITTER PARTY with Karsten on Monday, July 25th at 9:00 p.m. EST. It's going to be a blast with chances to win some goodies there too. 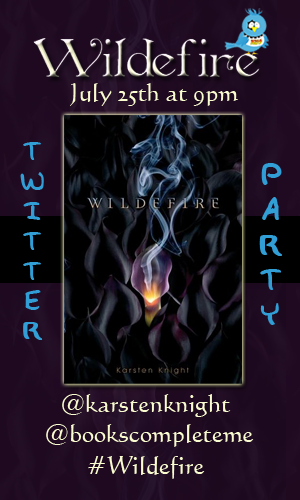 Just use hashtag #Wildefire to join in for the fun! I love Karsten! he's hilarious! I didn't realize that the author of WILDEFIRE was a guy, but now that I know, I've decided I'm in *LOVE*! Plus, that video was incredibly hilariously witty. I love dry humor and unicorns. Woot! Oh my gosh, this is hysterical. You may just have the best stop on the tour! Although #6 on that vlog conjures up a strange and creepy image. Wildefire is seriously awesome, and I don't think I'll ever spell that word without the extra e again. hahaha! He is hilarious, I'll stalk him on twitter now. LOL. I want to see the unicorn part xD. He is funny. Wanna read his book :D.